Kohler Brockway Sink in the Cottage Bathroom! Once in a while, one of the really awesome benefits of having this blog is that it’s kind of like I have more eyes thrifting for me. This kind of thing is a relatively rare occurrence—I’m not that fancy—but I do feel extra super lucky when I get an email or a tweet or a comment from a reader letting me know that they spotted this or that in a thrift store or on eBay or Craigslist and thought I might be interested. About a year and a half ago, I wrote about that nice rosewood credenza that a very kind and neighborly reader named Priscilla found and put on hold for me at a thrift store. That was really awesome when that happened. Priscilla has been kind enough to text me every now and then if she see’s something while she’s out and about…and girlfriend just went and did it AGAIN. So one day while I was busy working on the living room at my house, Priscilla texted me a picture of this 3-foot wide enameled cast iron double sink over at the Habitat for Humanity ReStore, asking if I wanted it since she couldn’t think of a reason to buy it herself. I don’t need it for my house, and it didn’t really fit into the cottage plan either, but come on…that’s a good-looking sink! 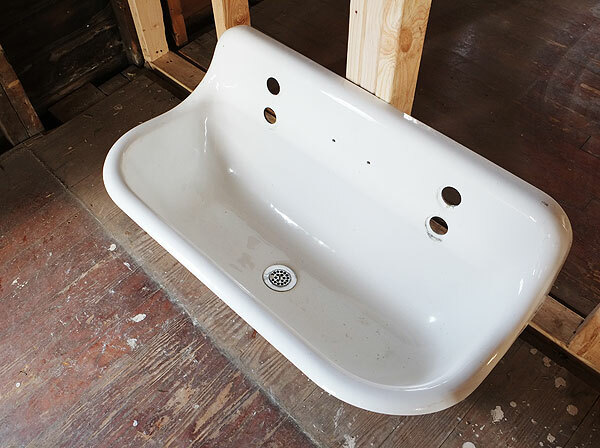 Originally I was planning on doing some kind of double vanity/double sink situation in the full bath at the cottage, but after thinking it over for a few minutes and looking at a few pictures of this model in use, I started to get really excited about using this instead. The holes accommodate 2 separate faucets, so it has the functionality of double sinks but the simplicity and glamor of a single basin. What’s not to love? I don’t know how old this particular sink is, but it’s actually still in production! It’s made by Kohler and is called the Brockway—looks like it retails for between about $1,200-$1,600, depending on the source. Mine was only $175! Such a score. It didn’t come with faucets, mounting hardware, or the soap dish that goes in the middle, so that’ll add a few hundred dollars, but that’s OK—it can all be ordered separately from Kohler, which is really nice. I don’t have the budget that would allow for buying this kind of thing new, so it’s exciting to be able to put something so high-quality in this house that will hopefully stay with it for a long, long time. This sink feels especially meaningful because back in October, Kohler held a small conference for bloggers at their headquarters in Kohler, Wisconsin, which I had the pleasure of attending! Admittedly, I went into the trip knowing next to nothing about Kohler as a company (other than that they made my toilet, which I like…), but I had such an appreciation for them by the time I left. What really struck me was how Kohler has balanced almost 150 years of design innovation (they started by making enameled cast iron bathtubs in 1873!) with a real respect for historic styles and production methods—something that seems really out of the ordinary for such a large, international company. We got to spend some time in a museum area of one of the Kohler buildings, and while it was interesting to see how much things have changed over almost 150 years in business, it was even more amazing to see how much has stayed the same. They still produce almost everything out of their Wisconsin factories, including so many classic styles that are really nicely suited to historic renovations. It made me so happy to see all that stuff right alongside their sleeker, more modern designs. On the last day, we even got to tour the factories, and I think the highlight for a lot of us was seeing the cast iron goods being made. In my admittedly nerdy sort of way, I like having this sink because I’ve seen firsthand exactly how it was made…coming out of the oven glowing red-hot, hot enough to melt the powdered glass particles that get sprayed on it to form the enameled surface…SO COOL. I wish I could go back, like, once a month. ANYWAY. Want to take a look at how great this sink looks in a bathroom? Yeah, I do too. I really like this picture because it’s so much of what I can envision for the cottage bathroom! I’ve been thinking a lot about plank walls for the entire upstairs space, including parts of the bathroom that wouldn’t be tiled. 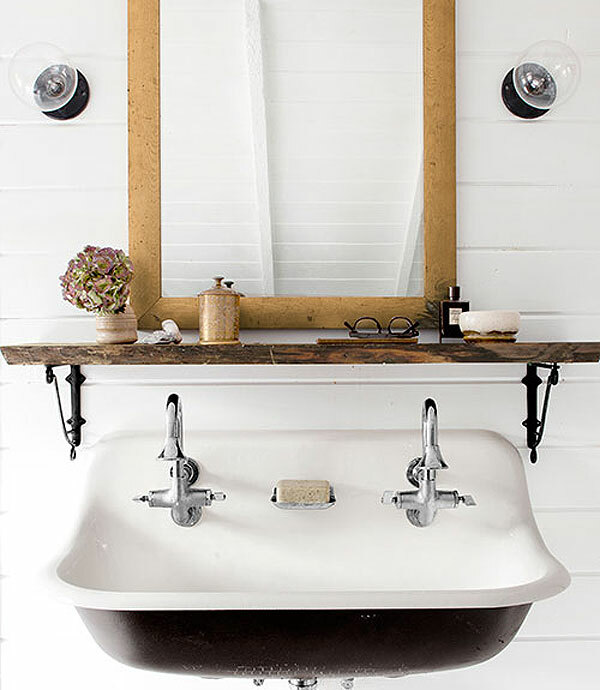 The reclaimed wood shelf, the mirror, the sconce situation…it’s all just so nice! What’s better than one double sink? TWO DOUBLE SINKS. So much sink action. And oh hey look, more plank walls! And a plank ceiling! And…BRASS. I’m admittedly not a huge fan of the Cannock faucet that’s recommended to go with the sink (maybe I’d like it more in real life? ), but I do really like these, and the brass factor just puts it over the top. I’ve never actually seen all-brass traps and supply lines in the real world, but damn. That looks great. Plumbing fantasies. Hot DAMN, this bathroom. Sooooooo gooooooood. 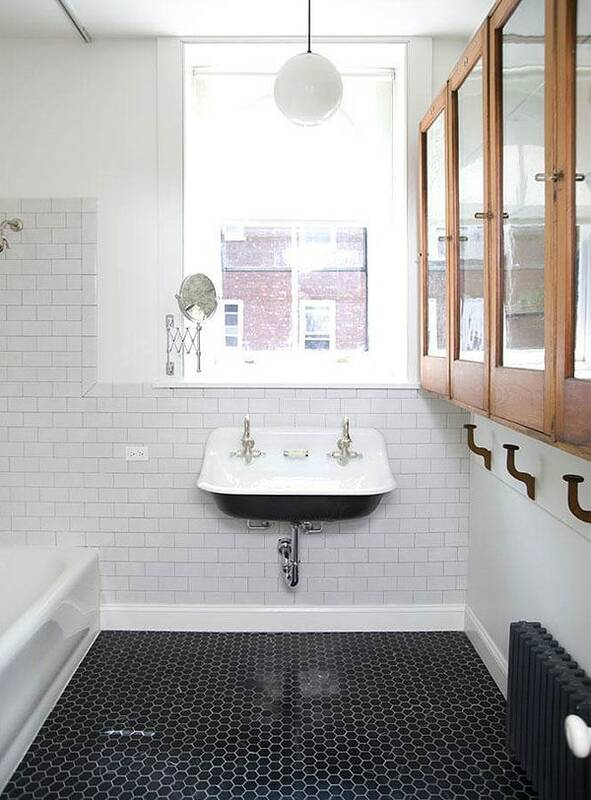 I sort of laughed when I saw this photo because the subway tiles and black hex floor tiles are also things I’ve been mentally tossing around for the cottage bathroom. Although my tiles would be ceramic and these look to be marble, but whatever. Oh, and I see you, skinny beautiful black radiator. And those cabinets. 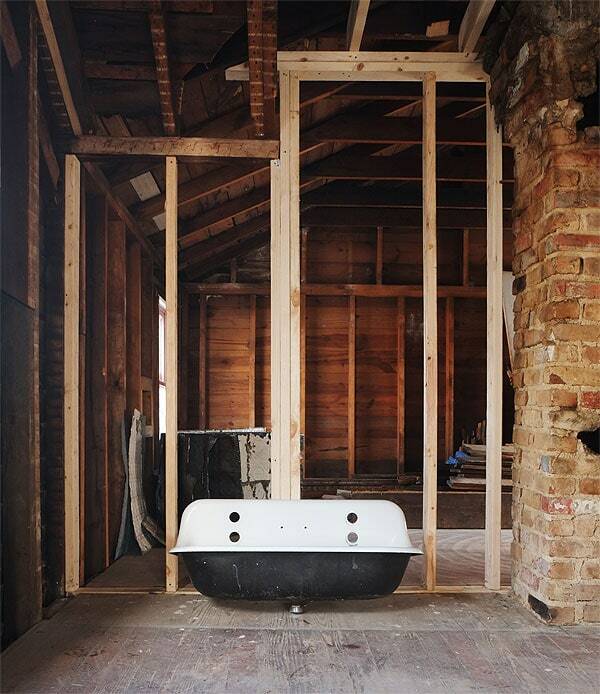 And that gorgeous tub. GUH. But the sink looks amazing, right? Right. It’s such a versatile piece. Looking at these fancy bathrooms makes going to my bathroom feel kind of like taking a dump in a porta potty on a hot summer day, but I don’t even care.